When Oscar first started hanging around our garden there was a lot of friction between him and our existing cats Pixie and Arty. Getting him neutered really helped as he stopped trying to get in fights with everything that moved. We took the process of integrating him into our household very slowly and I’m pleased to say that it worked really well. I got this book after a lot of the introducing had been done but it confirmed what we had already been doing as right and also gave us lots of tips to help the process continue to go smoothly. 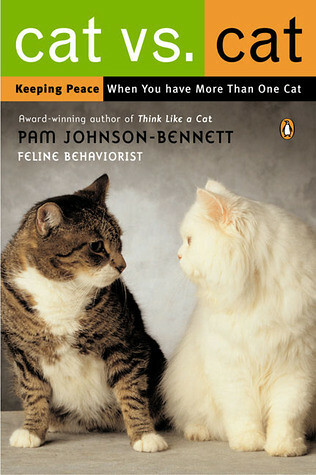 It was a really interesting read, especially the parts about the hierarchy of cats in a group and how they co-exist in a home setting. If you’re thinking about introducing a new cat to your family I think that reading this will really help. I know so many people who have got a new cat and it’s all gone wrong with lots of fights and unhappiness for both cats and humans. It is so important to take the process slowly and respect that cats don’t like change, especially when it’s forced upon them all at once. Yesterday for the first time, all three cats sat on the bed together, with me. I was so happy to see them like that, it really made my day. There is still the odd hiss here and there but no fights and they all get on pretty well. I don’t think they’ll ever be the kind of cats who snuggle up together but I don’t mind, it means more snuggles with me! > Yesterday for the first time, all three cats sat on the bed together, with me. I was so happy to see them like that, it really made my day. I had the same feeling! When like this, one step at time, our fur kids started to be closer to each other, sleep and eat together, etc. I adapted six adult cats, at different times. Some were harder than others, but today everyone respect their space. Patience is the key question!